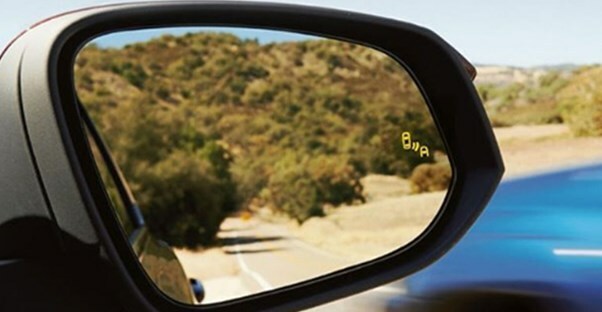 Blind spot monitoring can keep you from getting in an accident while driving. You may think that this is a premium feature only found on luxury cars - and at one point it was - but there are plenty of relatively-affordable cars out now that feature blind spot monitoring. The 2016 Ford Focus Titanium is a quality compact car that starts at a $23,225. You’ll also save money on gas with the Focus with an estimated fuel economy of 26 mpg in the city and 38 mpg on the highway. SYNC 3 technology comes standard as does the rearview camera, but the host of safety-minded add-ons includes the Blind Spot Information System, active park assist, and a lane keeping system. The Ford Focus can also be environmentally friendly with the electric upgrade, which can get you an EPA-estimated rating of 110 in the city and 99 on the highway. The Mazda3 four-door is another smaller vehicle with a reasonable starting price. It has an estimated fuel economy of 30 mpg in the city and 41 mpg on the highway and comes with a myriad of different safety features. A four-door Touring model comes with blind spot monitoring, rear cross traffic alerts, smart city brake support for $21,495. The technology of the Mazda3 is also remarkable with a commander control knob, Mazda’s Connect Infotainment system, and Bluetooth streaming so you can listen to your favorite music. The new Nissan Altima looks better than ever and still has a low starting MSRP of $25,460. The estimated fuel economy for the Altima is 27 mpg in the city and 39 mpg on the highway, and it comes with standard safety features like blind spot monitoring, rear cross traffic alerts, and an advanced airbag system with dual-stage supplemental front air bags. Some of the technological features include a six-speaker entertainment system, USB ports, steering wheel-mounted controls, and Bluetooth connectivity. The Camry is a mid-sized sedan, whose XSE and XLE models start at $26,310 and an estimated fuel economy of 24 mpg in the city and 33 mpg on the highway. Even though it looks sporty, you can add on safety systems like blind spot monitoring, a backup camera, lane departure alerts, and dynamic radar cruise control. Toyota also upgraded the Camry to include technological features like wireless charging, voice-activated features, Bluetooth connectivity, and an optional Entune App Suite, which includes Pandora, Slacker, and iHeartRadio. The Chevy Cruze is a compact car with a compact price of $16,975 as a starting MSRP. It’s a small car, so it gets a high gas mileage of 30 mpg in the city and 40 mpg on the highway. The Cruze also comes with a standard 7-inch touch-screen display with optional 4G LTE Wi-Fi, Android Auto, and Apple CarPlay. Blind spot monitoring is one of many available safety features, alongside options like a rear vision camera, lane keep assist, forward collision alerts, rear park assist, and rear cross traffic alerts. You can also subscribe to OnStar’s Automatic Crash Response System to alert emergency assistance if you’re unable to respond.